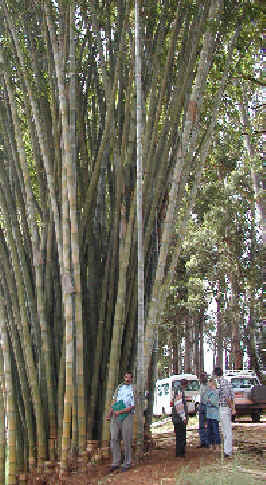 Giant bamboo at a farm in Thika, Kenya (about 40 km from Nairobi). few privately owned commercial timber plantations. Most of the country’s timber comes from government forests managed by the Forest Department. However, these forests have been severely over-exploited with only limited replanting. Timber firms are now reportedly forced to import the product from the Congo and Tanzania to manufacture hard and soft board. The country’s leading paper manufacturer, PanPaper of Webuye, is also reportedly using plantation softwoods to fuel its boilers and make paper pulp. With its rapid growth and high woody fibre production, bamboo would supply both industrial needs. At the household level, bamboo would be a valuable source of firewood and charcoal. It yields more than 7,000 kilocalories per kilogram, equivalent to half the yield from an equivalent amount of petroleum. Some species of the plant have large thorns, making them ideal for security hedges. Others grow tall straight culms that form ideal windbreaks that can be sustainably harvested annually. And of course edible bamboo shoots would be a nutritious addition the family table. These shoots, mild and very crunchy, can be eaten raw or cooked. KEFRI already grows several high quality edible varieties. Bamboo rhizomes anchor topsoil along steep slopes and riverbanks, very effectively controlling erosion. Bamboo leaves, sheaves and old culms that die and fall to the ground decompose and create a thick humus layer that enriches the soil. Studies in South East Asia and Kenya have also shown that natural bamboo forests have excellent hydrological functions that promote soil health. Some species of bamboo absorb as much 12 tonnes of atmospheric carbon dioxide per hectare, a valuable asset to deploy against global warming. But bamboo is vulnerable to insects and fungi and its service life can be as low as one year when in direct contact with the ground. However, this can be remedied by appropriate design and cautious use of environmentally friendly preservatives such as boron, according to TRADA (Timber Research and Development Association). In April 2004, fears were also expressed that flowering bamboo would trigger famine in Northeast India, arising from an upsurge in rat populations. Bamboo can be propagated from seeds, though most species flower just once every fifteen to one hundred and twenty years. More viable mass propagation techniques include tissue culture, rhizome cuttings and vegetative cuttings. “A man can sit in a bamboo house under a bamboo roof, on a bamboo chair at a bamboo table, with a bamboo hat on his head and bamboo sandals on his feet. He can at the same time hold in one hand a bamboo bowl, in the other hand bamboo chopsticks and eat bamboo sprouts. When through with his meal, which has been cooked over a bamboo fire, the table may be washed with a bamboo cloth, and he can fan himself with a bamboo fan, take a siesta on a bamboo bed, lying on a bamboo mat with his head resting on a bamboo pillow. His child might be lying in a bamboo cradle, playing with a bamboo toy. On rising he would smoke a bamboo pipe and taking a bamboo pen, write on a bamboo paper, or carry his articles in bamboo baskets suspended from a bamboo pole, with a bamboo umbrella over his head. He might then take a walk over a bamboo suspension bridge, drink water from a bamboo ladle, and scrape himself with a bamboo scraper (handkerchief)”. Quoted from A Yankee on the Yangtze. William Edgar Geil. London: Hodder and Stoughton. 1904. In Yangtze Patrol. Kemp Tolley. Annapollis: U.S. Naval Institute Press. 1971. Page 268. The Sun Jar collects and stores sunshine so you can use it at night! Simply leave the Sun Jar in a sunny window during the day for about 5 hours of warm glowing light at night. How does it work? An ingenious combination of old and new, the Sun Jar is made from a traditional Mason jar and high-tech, energy-efficient lighting. Captured inside the jar are a highly efficient solar cell, rechargeable battery and low energy LED lamps. When the jar is placed in sunlight the solar cell creates an electrical current that charges the battery over a few hours. This energy is then used at night to power the three LED lamps inside the jar. There is no switch on the Sun Jar — no visible controls at all — instead, a clever light sensor inside automatically activates the light when it gets dark or the light turns out. Magical! The beautiful frosted glass Mason jar is completely water tight — so the Sun Jar can happily be left outside in any weather conditions. 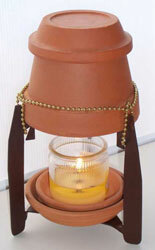 A perfect garden light or night light for a child’s bedroom! Original design by Tobias Wong. As seen in DailyCandy. The green gift of the year! Evergreen goes NOT FOR PROFIT!!! After watching the troubles that our friends on Roatan are facing, we have decided to conduct our business operation in a way that helps out in the best possible way. So we will quote all systems for Humanitarian organizations in the Bay Islands on a “Not for Profit” basis. This way we can help electrify all of the clinics on the island with solar power within five years. And we may be able to help more! based upon individual credentials, we can go to our suppliers and ask for further discounts on a case by case basis! A cheaper system does not mean a “cheap” system, our humanitarian work gets even more closely looked at by our team of engineers on the “Solar Panel” All of our other projects will receive the very best pricing, and design service possible. For those of you who didn’t know already, this week is “Green Week” at NBC Universal. On Monday (till the end of the week) the network started broadcasting 150 hours of environment-themed programming on its various TV channels and other properties. Green themed programming includes prime time shows such as “The Office” which will air an episode about the company considering recycled paper. And then local NBC stations are incorporating green-themed stories into their newscasts. As a Healthy Living Consultant, I spent this morning at the Farmer’s Market with NBC11 talking about “How to Have a Green Thanksgiving.” The segment will air on NBC11 this Thursday at 6.45pm so stay posted! I think it’s a great opportunity for Ecopreneurists. Both in terms of finding interesting eco businesses…as well as a tool for drawing visibility to your own eco business. Last year, the company launched its first Green Week and also a “Get On Board” program to encourage consumers to reduce greenhouse gases and raise awareness. This year’s theme is ‘Green Your Routine,’ the network will feature tips and resources that offer consumers advice on this area: green cleaning companies, sustainable food producers, greening your commute and so on. More information about the programing can be found here. So Ecopreneurs, it is time to start creating you NBC pitch. 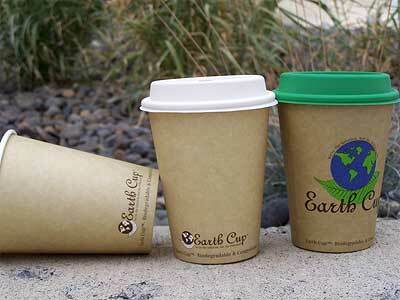 Your company or product might just be their next Green find!